While they may seem like harmless little creatures, termites in Queen Creek, can actually cause a ton of damage to your home. Termites can turn out to be a serious threat if not removed in time. These creatures feed mostly on wood. Therefore, their presence in the house can cause costly destruction. If the matter is not looked in-time, the damage made by the termites will be irreparable. Finding out the hideout of termites can be quite tough as they generally reside under the ground or live in structures on which they feed. Your local Queen Creek termite exterminator can detect termites long before damage to the naked eye becomes visible. Varsity, even provides free termite inspections for your home or business, which is a great starting point for a pest and termite control routine. The first and oldest cure for the removal of termite is the liquid treatment. Termiticide is poured into and around the area affected by the termite. The whole house and the underground are treated with the same liquid. Nevertheless, the modern techniques have replaced the above form of handling. Bait treatment is more successful method of termite removal and is eco-friendly too. In this process, stakes containing wood is placed everywhere. Once the sign of termite is found, the wood is then replaced by canister. This slow acting poison that is carried back to their hideout by termites will affect the entire termites living there and eventually, kills them all. This is a very effective way of treating the termites. The other method is borate wood treatment wherein the wood is treated with chemicals beforehand. In case termites attack the wood the chemicals on the surface lead to death of the termite. Maybe you suspect that your Queen Creek home is visited by termites, but you aren’t sure. Some tell-tale signs of a termite infestation include discarded termite wings at or near entry points to your home such as windows or doors. Because they essentially only need their wings once, on the way to their new domicile, they discard them after arrival. You can tell them apart from other insect wings, because they are equal in size and not one larger an one bigger wing part as with many other insects. Another sure sign of termite activity is the presence of mud-tubes, which can be found near the foundation or where the walls meet the ground as termites enjoy a certain climate that they can achieve by building these mud-tubes. Hollow sounding wood can be another indicator of termite infestation. Because they feed on wood from the inside out. There are many other signs for the presence of Queen Creek termites in your home, but these are the most common one. Consult your experienced pest control professional to determine if you are dealing with termites and to devise the best course of action. 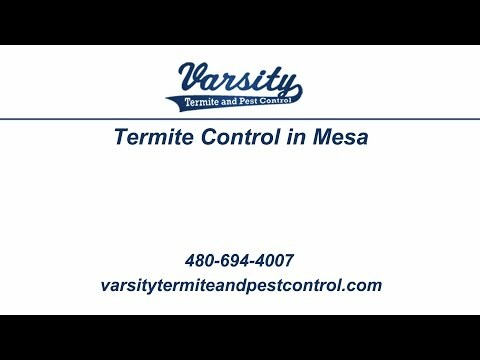 Varsity has been providing top termite and Arizona pest control services for many years at great rates. Contact us today to learn more or to get an inspection scheduled.